In the disaster/thriller HOURS, Paul Walker stars as a father struggles to keep his infant daughter alive in the wake of Hurricane Katrina. 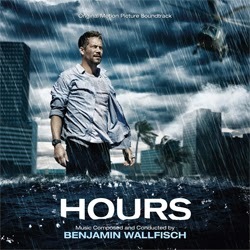 Newcomer Benjamin Wallfisch makes his exciting Varèse Sarabande debut with his powerful and emotional score for HOURS. Panteleon Films will open HOURS on December 13. Benjamin Wallfisch is one of my new favorite composers and here he tackles another great score and wins on all levels.